Having a more industrial space (think exposed brick walls, or an industrial city loft), consider installing piping to use as a bookshelf. 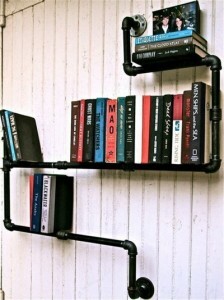 Opt for old, iron piping and have fun with the elbows to create a unique design that stacks your books on the wall. 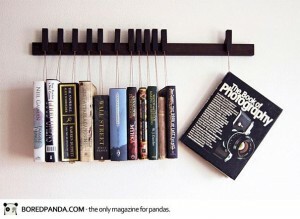 Great for a country style home, use threaded string or rope to hang your favorite reads. Knot the rope into a small wooden slat at the bottom, and the books will have plenty of support, ensuring that they are kept in great condition and the pages are unbent. Find an old, wooden folding ladder and anchor it to an unused corner of your room. Stack books horizontal and vertical to give an extra volume effect. 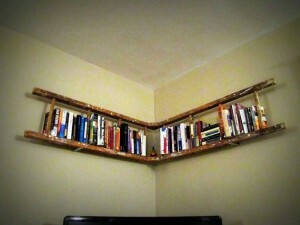 Ladder bookshelves are great for large, open rooms. 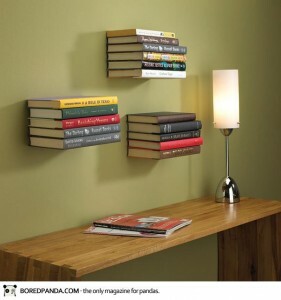 Use L-shaped brackets, and offset their placement on your walls. 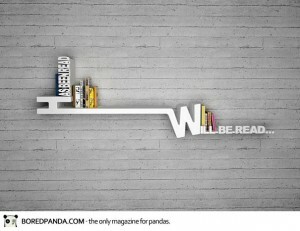 The result will be floating books, not floating shelves. Stack books on top of each other for a nice full effect. For extra character, place pictures and small trinkets on the top of each book. Shelves don’t have to be predictable. Books are treasures; relics from adventures we’ve gone on, things we’ve discovered and learned, and things that resonate with our hearts. Those books shouldn’t hide on cluttered shelves. They should be given focus and personality in your space.